Ivan appears in Smerdyakov´s room. Smerdyakov asks "Why are you worried? That it is the trial tomorrow? I won´t give evidence against you. It wasn´t you who killed, not you." Ivan replies "I know it wasn´t me!" "Do you now? Well in fact you did. And they knew about the murder… All who knew left and appointed me the murderer. You are the principal killer." The Devil appears with a mandolin under his arm and a case in one hand. He quickly passes by the conversationalists as if he does not see them. Ivan follows him with his eyes. 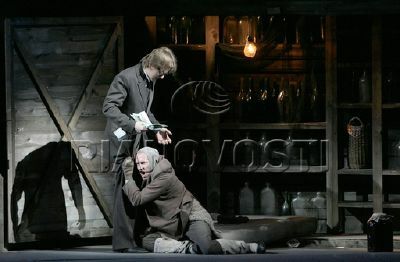 Smerdyakov places a packet of bank notes before Ivan. "There. All three thousand. Take it."